Automatic controls for heated driveway and sidewalks will save you money by activating the system only when required. Sensors will capture moisture and temperature to anticipate snow falls and freezing temperatures. Warmup offers a selection of controls for heated driveways and sidewalks to suit your project. When to use the DS-5C, with optional CDP-2 remote control? The DS-5C controllers are for smaller projects up to 360 sqft. By combining the controller and sensor in one device, they are a simple addition to the Warmup heating system. These intuitive outdoor controllers will automatically activate based on readings from the temperature and moisture sensor. 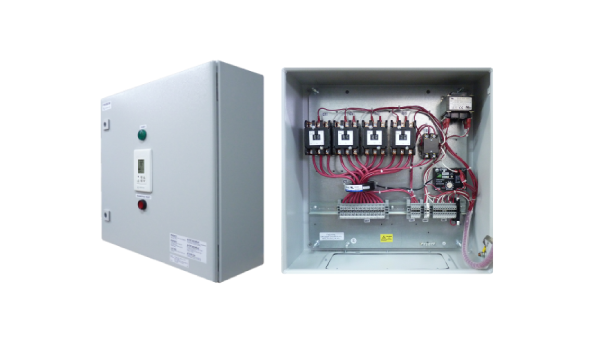 The DS series controllers are “all-in-one”, with a mounted sensor and built-in relay contactors. DS controllers mount outdoors but come with the optional CDP-2 remote panel for indoor override. This indoor remote control panel mounts in a typical electrical and connects to the controller via communication wire. A 12” communication wire connection is included. Extensions to be supplied by the contractor. When to use the WSM-63 snowmelt control? The WSM-63 is the newest addition to the Warmup family of controls and offers both manual and optional sensor operation of your snow melting system. With a capacity of up to 252A (up to 1,500 sqft of snow melting) is suited for both residential and commercial environments. The simple ‘on/off’ button allows you to trigger the system manually. But it can be paired with an ASEDS-2C sensor to operate automatically. When to use the Commbox-600 control panel? This control panel includes everything. With built-in relay contactors and GFEP protection, this panel can switch up to 4 times the supplied voltage. This means you can create up to 4 zones but power them one at a time, thereby reducing the amount of amperage needed to run the system. Ideal for larger projects over 1000 sqft. The AirSense is a smart and reliable snow and ice sensor that works with the Commbox-600. Installed outdoors, it measures the temperature and detects snow, sending the information via the controller to the heating system. The AirSense is connected to the Snow Melting Controller with a 30ft (10m), 24V 4 wires cable and communicating with the controller, providing the temperature value and the snow detection based on the adjustable parameters. The plastic ‘igloo’ shape design helps to assure reliable Snow/Ice detection as it prevents the snow to accumulate around the sensing area. The 4 holes around the sensors were designed to hold the anti-nesting spikes, keeping birds away from the sensor. The sensor cap helps to keep the sensing area clean from dust and dirt during summer time and when the snow melting system is not used. The measured temperature and the snow detection are visible on the backlit LCD display of the controller. Not sure which control is best for your project?